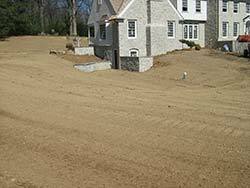 Excavation for patios, basements, additions or sanitary, water and storm water utility lines. B.R. Kreider Driveways offers a full list of residential excavating services for homeowners in the Lancaster, Manheim, Lititz, Hempfield, Hershey, Elizabethtown, Lebanon and South Central PA region. Since 1936 we've been grading, excavating, trenching and digging around residential homes and developments. If it involves moving dirt in your yard... B.R. Kreider Driveways makes it happen. 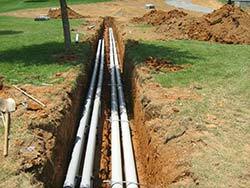 From digging house basements and excavation for patios to troublesome drainage issues B.R. Kreider Driveways has the needed equipment, professional staff and proven experience to get your project done right. Contact Randy Gibble, Director of Residential Excavating Services, to assist you in planning your project. 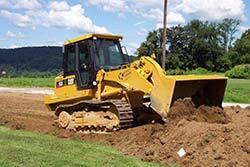 For larger commercial excavating work, please visit our commercial B.R. 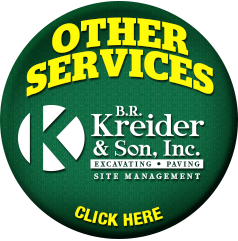 Kreider Excavating and Paving website.